It has been raining again, in fact, it rained all night. This morning while looking out of the window I spied my neighbor (a woman from Jordan) shouting at her four year old daughter for standing out in the rain. The child, oblivious to her mother’s irritation stood in the rain blowing soap bubbles and laughing as she watched those bubbles floating away. I watched her in fascination, rooted to the window…remembering this forgotten childhood activity and wondering when and where I had lost that childlike joy in life…the art of finding happiness in small and insignificant things in life. A dam of childhood memories burst open, drenching me through and through. 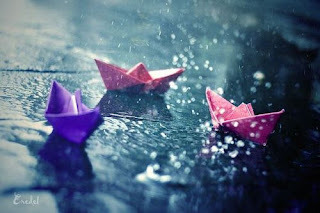 I remembered floating paper boats in water puddles after a heavy rain. I remembered climbing the tree outside the school premises in Port Moresby. Clinging to the branches, hiding up above while people passed by below. I remembered wanting to be like Nancy Drew and observing people around me to improve my detective skills…!! I remembered looking for small flat stones to skip on water ponds and betting with my brother on whose stone would skip three to four times over the water. And amidst all those memories, I wondered..Why had I forgotten those small joys ? Why had I allowed myself to believe that they would never return ?? I have decided to go out in the rain next time it rains. To feel the rain on my face. To once again float a paper boat in the next puddle I see. If wishes are horses, I would like to rewind the time and plunge myself into my childhood days when rain came as a manna to me.Oh, those rainy days ... even now it's raining in my heart whenever I remember them with a flourish. hi mumma.....i read some of ur articles.... really really good!!! n this one was simply gr8 ...." simple and expressive"......i can really imagine u sitting by the window....bas chai ke cup ki jagah "steel ki glass"(aapki fav. ;) haath mein hai....too good! we r proud of u !!!!!! reading your childhood encounters with rains , I recall, how much i would love water-logging deep within my heart.. to avoid going to school and then look for reasons to go out to bring some daily household stuff .. just to check the depth of water :D . I used to love this even when I was in 12th standard. Rains and Childhood has a special connection. We all have lived through it.